Update April 19, 2015: I do recommend using a bit of powdered orris root or powdered oakmoss as a fixative. The ylang ylang enfleurage was overpoweringly strong at first, but the scent faded over time. I’m going to mix orris root in with the powder and re-enfleurge the flowers. On June 15, I was working on the first re-edit of my upcoming book Perfume From Your Garden, checking references, when I stumbled across a few sentences in a vintage perfumer book that stopped me, and truly surprised me with some wonderful information. The process of enfleurage des poudres aka powder enfleurage, the manufacture of powders perfumed by flowers, is very ancient. The process takes place by simple contact, in a closed receptacle, and the flowers are removed and replaced with carefully chosen and sorted ones. The authors state that this ancient process was the inspiration to the French for oil and pomade enfleurage that they began in the 17th century. I immediately knew I had found some incredible, long-lost art form. So many artisans are now enfleuraging with oil and pomades, the use of powder is an easy adaptation. So, I decided to post an excerpt from the book, ahead of publication, so that readers could enjoy this new process with the lovely summer flowers in their gardens. I hope you enjoy this! “Powders treated in this manner included the plant powders, orris, ambrette, oakmoss; amylaceous matter, starch and faecula;* and minerals, crayon and talc; the flowers used included jasmine, hyacinth, jonquil, orange flower, nutmeg. rose, mignonette, tuberose, and even wallflower and lily-of-the-valley. By an analogous process, hides and gloves have been perfumed with the same flowers, and also with violet and crimson carnation. *amylaceous and starch are synonyms and faecula means a starch made from plants or seeds. I felt like an archaeologist who had stumbled upon a long-forgotten (in authors Naves and Mazuyer’s words, “long-abandoned”) method that was the reason that other methods came into being, like the cold and hot enfleurage processes detailed in this book. What a revelation that garden perfumers can capture the scent of gardenias, magnolias, roses, lily-of-the-valley, heliotrope, linden, and dozens of other fragrant plants in a luxurious, true-to-scent, body powder. For historical purposes, I was also thrilled by the mention of the glove and leather scented processes mentioned, as they gave birth to the first perfumers guilds, as I am the head of the Natural Perfumers Guild. Further research showed that these powder enfleurages were the methods used, in the early perfume industry in France, to produce dusting or body powders, not mixing essential oils and absolutes with powder, which is a new method. “What’s old is new again”. True, nowadays, many artisans, copying the methods of the larger cosmetics industry, make these aromatic powders by adding essential oils, dried powdered flowers, and absolutes to a base powder such as arrowroot, tapioca root, non-GMO corn, and some clays. But how many have true gardenia absolute? Or use pricey rose essential oils or absolute? Since many artisan perfumers around the world are reviving enfleurage, I am happy to present to everyone this most ancient enfleurage method. For the two decades I have been on perfumery forums and discussion groups, read ancient perfumery books, and followed blogs and spoken with perfumers, and I never found anybody writing about this method. I’m going to focus on a few rare flowers in my garden, like ylang ylang, golden champaca, various jasmines, and Vietnamese and Tahitian gardenias. Well, at least that’s my start! Imagine capturing the scent of your summer roses, lavender, or other delicious plant in powder, and using the results as gifts. I immediately got some arrowroot powder and harvested some of my ylang ylang flowers and tested the process. Great success! With only one enfleurage, using eighteen ylang ylang flowers and about 2.5 pounds (approx. 1100g) of arrowroot, within one day I had a highly-scented powder. The next day I only had six ylangs to add, but the strong scent of the one day/eighteen flowers almost took my breath away! The next day, when my apprentice Paula came by, she harvested more, and we were almost overcome by the strong scent! She actually asked “is it possible to infuse too much scent?” I replied that if that’s the case, we can just “dilute” it with more powder. We both commented on how the ylang powder scent was so much richer, and intoxicating than the living flowers or the oils – it was overwhelmingly sensual! Gently tapping the cover powder over the ylangs to ensure contact between the flower petals and powder. The tray cover was then put in place to cover and keep the scent in. Powder enfleurage is the easiest and quickest way to draw the fragrance of botanicals into a usable product. Small children can easily make this with adult supervision. 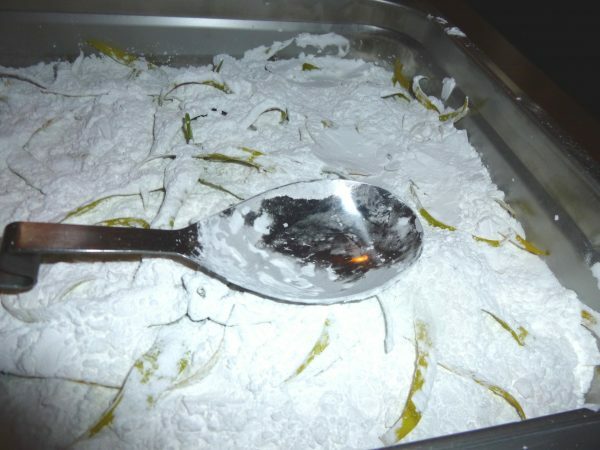 Powders are made by simply placing the flowers or leaves (I’m using scented geraniums and mints) in a layer, in a powder. I recommend arrowroot, tapioca root, rice, or non-gmo cornstarch. I would add powdered orris root, or powdered ambrette seed in small amounts to the finished powder as fixatives. You may have to purchase them, because they’re rarely grown in home gardens, but it’s well worth it to have a fixative to make your powder enfleurage last longer. The enfleurage is made in a closed container, and the flowers are sifted out and replaced by recharges. I love to use mint leaves, scented geranium leaves, any flower, and citrus peels with the white pith removed. You may wish to mix a lot of different botanicals together, and make a millefleurs poudre, or you may wish to stick to one scent. My first powder enfleurage was just ylang ylang flowers and arrowroot powder. Heavenly! You can always decide at a later date to mix your one-scent poudres to make a unique dusting powder. If you study perfumery, either by taking classes, or a course, or study on your own, you’ll love this addition to your scented products. o Choice #1: Scentless powder, such as arrowroot, tapioca non-gmo cornstarch, rice flour, or one that you may prefer. I recommend at least one pound, 454 grams, to start. o A closed container, that is shallow, a rectangular or square shape is best, such as a restaurant steamer tray, with a lid that fits snugly. They come in various sizes, so choose one that suits your current project. o Drying rack or flat surface if very moist botanicals needs to wilt slightly. Towels, cheesecloth or other porous material spread over an object like an oven rack or screen can work for this purpose. o Freshly-picked botanicals that are allowed to wilt slightly, if necessary, in a cool, dark place, placed on the drying rack described above. 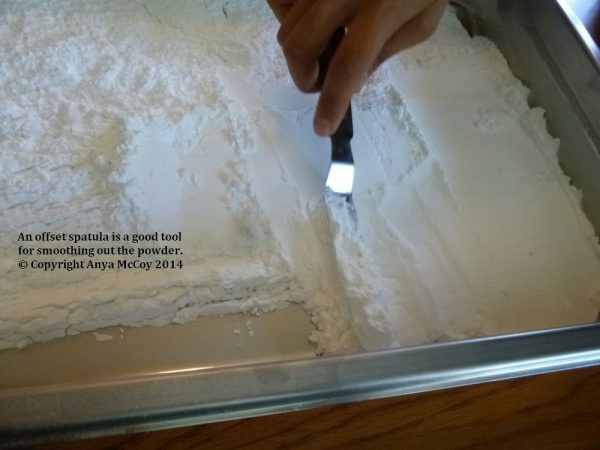 o A spatula, offset spatula, big spoon, or piece of stiff cardboard to move the top layer of powder for recharges. o Chopstick, fork, or other implement to check on the stage of dryness. o A pan sieve or stainless-steel strainer, or just your hands to remove the botanicals. o A chopstick or other instrument to gently tap powder off the botanical when you remove it for recharges. o A decorative container, either with an attached lid with holes to shake the powder out, or a removable lid and a powder puff. Vintage ones are available on Etsy or other Internet sites. This extraction process should be conducted indoors, with no fans on. Harvest the botanical, and let it dry slightly if it’s extremely moist, (eg lush flowers, mint leaves). Generally, they should be harvested when they are dry, not after a rain, or when morning dew is on them. Take care not to bruise the botanicals. Empty the powder of choice in the container, using half the powder for the base. Use an offset spatula to smooth the powder (optional). Place the botanical on the powder base, not overlapping, just having the edges touch. Put the remainder of the powder on the botanical. Press the powder down gently to ensure surface contact between the botanical and powder. I use a piece of cardboard, or a broad spatula. Place the container indoors in a warm, dry place, out of the sun. Check the botanical for dryness once a day. You want it to be very dry, with no moisture remaining. It typically will be dry in one day. When dry, take care not to greatly disturb the powder as you either carefully remove the botanical by hand. Gently tap the botanical with a chopstick to release clinging powder. There will always be some powder remaining on it, that’s unavoidable, but you want to get the excess off, back into the extraction container. Move about half the powder with a spatula to one end of the container, making a small mound. Leave a layer of powder on the bottom of the container, allowing this layer to be about 80-90% of the surface area of the bottom. Recharge the botanical as described in Step 3, and put the top layer of powder back in the container, repeat Steps 5 – 8. When the powder is scented to your liking, stop recharging with the botanical. Use a sieve or strainer to remove any last bits of the botanical from the powder, if necessary. Place the powder in the container of your choice, label with powder used, botanical used, number of recharges, and the date. It’s summer in the northern hemisphere, and many of you have gardens bursting with beautiful flowers. My friend Andrine just harvested linden flowers and buds in Seattle and is using powder enfleurage to extract their scent. 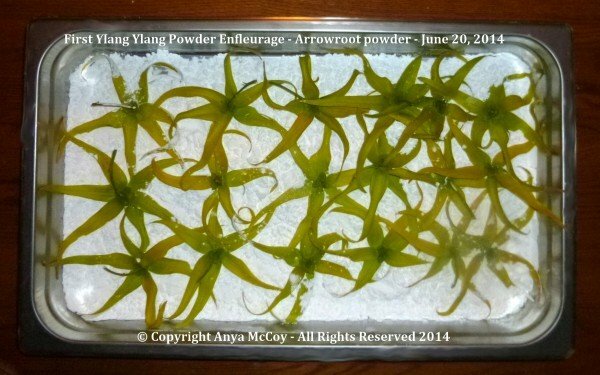 The powder enfleurages can be packaged into nonporous containers to help them retain scent. You can choose screw-top plastic shaker bottles, like those sold in the store for baby powder, cardboard tube powder dispensers (may allow the scent to evaporate over time), metal shaker top canisters, or powder boxes that look pretty on a vanity or bureau. These can be modern or vintage, and a fluffy powder puff is delightful to use, as it brings a very feminine touch to getting dressed. If you decide to make powder enfleurages to use as deodorants, you may want to choose a shaker top container, so you just have to shake a little into your fingers for application. Two days ago, as I was falling asleep, which is always a great time for ideas to slip into your consciousness, I realized that it would be possible to infuse scented vapors from resins, powdered woods, and incenses into the powder! A few years ago I blogged about the incense warmers sold by Katlyn Breene of Mermade Magickal arts and how they made it possible for me to use incense again. I had become allergic to smoke, but the warmers didn’t produce smoke, they warmed the botanical so that the aromatic vapors filled the room. 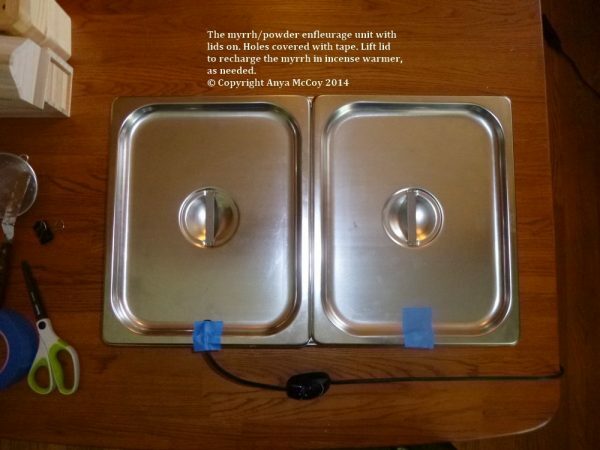 See below to photos of how I rigged the Golden Lotus Incense Warmer in a restaurant steamer tray and infused the powder with myrrh. The result is gorgeous, and I’ll be infusing frankincense, powdered aloeswood, sandalwood and other botanicals into the powder soon. This way, you get soft, perfumed powder without any ground resins in it, which can get gummy on the skin. Leveling the powder base for vapor essence enfleurage. 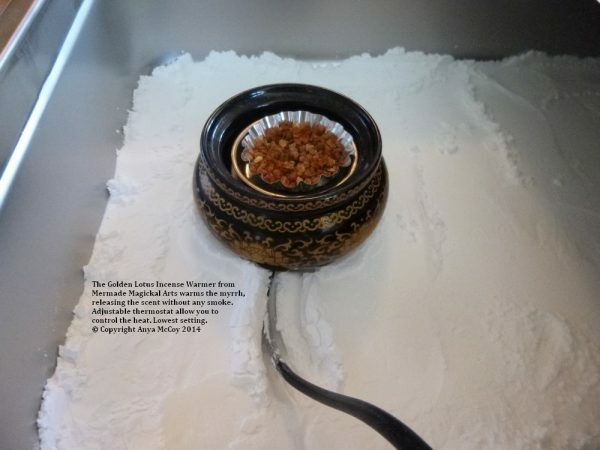 The Golden Lotus Incense Warmer from Mermade Magickal Arts with Myrrh nestled in powder enfleurage tray. Myrrh powder enfleurage trays covered with tape over cutout for power cord. 2. Visit my Facebook page https://www.facebook.com/AnyasGardenPerfumes and “like” the page. That will give you two entries! 3. Please share the post about this that’s on the Facebook page, and anywhere else on social media you like. I really want to get this out to artisans, who can begin working on this new art immediately. 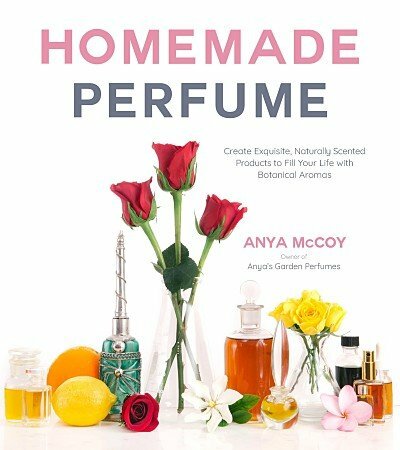 This entry was posted in Anya McCoy, Anya's Garden Perfumes, enfleurage, Giveaway, Perfume From Your Garden book, raw materials of perfumery and tagged enfleurage, powder enfleurage, vapor essence enfleurage on June 26, 2014 by Anya.